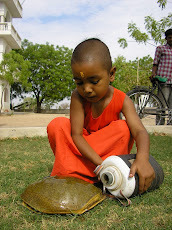 These photos were taken in early November on a trip to the places in Nagaur District, about 20km from Khatu Ashram, where we are delivering water. On this day I visited the villages of Durgastau, Chapra,Rotoo, Dhanani and Setudau. The area where these villages are located has severe problems with the groundwater. It is so salty that animals that drink it immediately get sick. The tankers are putting in various places in and around the mentioned villages in the pre constructed watering troughs. Oh no, it can't be true. In Rajasthan the English text books are not famous for the quality of proof reading. There are usually a lot of spelling mistakes inside. But the first word! On the cover. 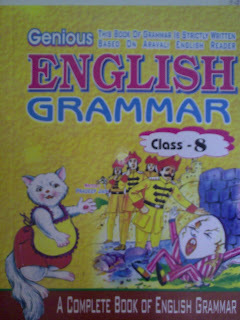 Of an English Grammar textbook! That is the work of a GENIOUS! 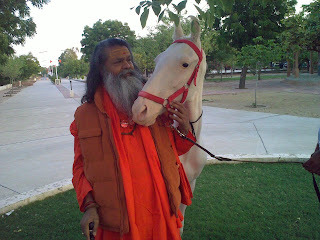 Whilst in Jadan in October Gurudeva was checking the new addition to the horse stable, Swetmani (the white jewel). Swetmani is 7 months old and has a temperament that has won many hearts. It is a little after the event (it was in September) but I didn't get time to update the blog. Janmasthmi is the joyous celebration of Lord Krishna's birthday. 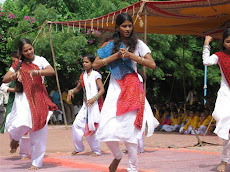 It is celebrated with a lot of dancing and acting out lovingly the events of Krishna's notoriously naughty childhood. The little boy who played the infant Krishna won everybody's hearts as he patiently sat as the girls danced for him. The celebration culminated with the making of a huge pyramid to help "our Krishna" (the boy at the top of the third photo get to a pitcher of butter hanging from the roof (also in the photo). The story is that Krishna was extremely fond of butter and whatever butter his mother made he would find and eat. To try to save it she hung it from the roof where he couldn't reach. 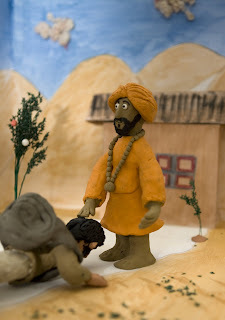 However in order to reach it Krishna would get all of his friends to "help him up" to the butter and then bring it all down so that they could eat it. The boys from the hostel were celebrating today the special day of Lord Ganesha, the remover of obstacles. They are a great bunch of kids this year. Really really special. For some of these kids it is probably the first time they actually saw a computer, let alone used one. It is awesome to watch the computer world unfold before them. 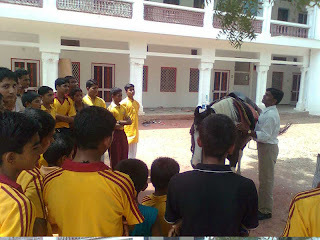 The boys who are staying in our Ashram get to go for horse riding in the mornings. Last Sunday they received some extra knowledge about horses, how to handle them and how to treat their ailments from Dr Naveen Parihar, who is a well known vetinary doctor in our area who specialises in horses. We started the new school year on July the first and it has been quite chaotic since. 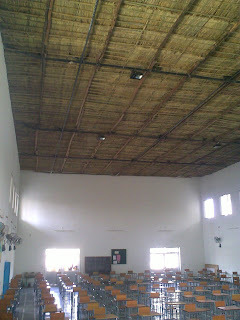 The building works did not get finished as planned and we have been stuck with a few more classes than classrooms (maybe more than a few). There are classes going on in the verandhas, in the hall there are two classes and in some rooms we put two classes inside and faced them in opposite directions. All in all we now have around 1400 students in the school! A fantastic response. Similar to last year it has been very hard to refuse people admission as we are just too full. I think we must have turned away more than 800 people this time. Now slowly we have adjusted the timings of the school so that we can fit everyone comfortably until the rooms are ready. The school has been split into two shorter school days, one for senior classes and one for primary classes. It isn't a perfect solution but it will do for now. Meanwhile construction work is going on for the building of the extra rooms. We have had a lot of visitors from overseas here in the last weeks and they have been helping get things going by transporting the bricks on the site. It's inspiring to get such help especially in the heat of the monsoon. This morning a severe storm blew through the Ashram. The photo shows what happened to our parking shed which is about 50 m away from the scene of the photo. With the storm came rain meaning that today may be the first day with a temperature below 40 since 23rd of April. Today we received the results from our 12th class science students. They did excellently, all but one have passed and one girl has come in the top 14 students in the District. It was the first "batch" to sit the 12th class science examinations and they have outshone all expectations. A few weeks ago I was looking for educational software for installing in our school computers. We have some good programs and one of my favorites was called Maths Circus from Greygum Software. I was looking on their site and wishing that we could get everything what they offer but...........it was out of our budget. The Maths Circus which we had originally was sent over by my Mum. Of course Mum is great and always supporting the school but this time I thought it isn't really appropriate to ask her to send over 1000 dollars worth of games software. What to do? I thought we might try our luck and write to the company . The response was immediate and wonderful. Greygum sent over our order charging only the cost of the blank CDs and the postage, at the same time apologising that normally they would pay the postage themselves but due to the economic downturn things were too tight to offer that. To Steve and all the team at Greygum thanks a lot. The programs were already installed last week and our students are joyfully discussing the best way to land a hot air balloon, mow the lawn and creating their own worlds in the Land of Um. As it is now holidays for the first time all of the buses in our fleet are together for some weeks. Once again thanks to all who helped us get them. School finished for the 2008-09 session on Saturday and the students now have 6 weeks break. It was anyhow getting to hot to expect them to think. We haven’t had a summer like this one for a few years. The last time that the temperature was less than 40 was a month ago and the last five days have been 45 degrees and above. What a corker! The average temperature in the last month is above 43! The enthusiasm of the public continues towards getting admission. In the last two weeks we have had more than 500 applications. Considering that the real “season” for admissions will be in late June it has been surprising to have so many people come so early. Having purchased two new buses this year we are able to add some more villages on our routes. So far we have added two isolated villages called Surayata and Talka. It takes some planning to take on a village and depends on the enthusiasm of the people, the distances involved and the roads. A big issue is whether the buses will be able to go to the village during the 3 months of the monsoon rains as some roads are not sealed or cut by watercourses in heavy rains. 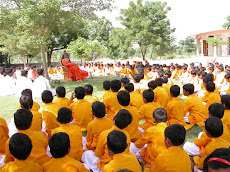 At present we have a list of 19 villages that have requested that they be included in the Ashram school all within a radius of 20km from the Ashram. For each village that we consider we go first and talk to the villagers, check the roads, get an idea of how many students are interested and explain to the villagers our expectations regarding the studies of the students. It’s a beautiful process involving a lot of sitting, talking, drinking chai and taking in the unique scene that is life in the small Indian village. I was driving along the other day on the way to purchase the buses and saw this sign on a country road. As a Sydneyiite it was appreciated fully. Today the board examination results for 8th class were announced. All of the students did well with a lot of them suprising themselves. In total in our District 37176 8th class students sat the examination from more than 5000 schools (it's not a typo - thirty seven thousand students). From our 43 students who sat the examination 5 of them have come in the top 100 students in the district!! I think that they can all take a bow. Really really awesome. We are looking forward to seeing them when they come for their report cards tomorrow. 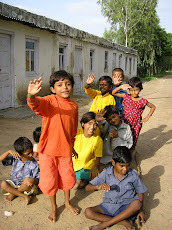 "Do your work where your greatest joy and the world's greatest hunger meet"
Previously i have blogged about the program of Twin Vision team in our school in January. 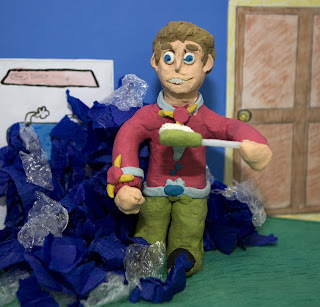 The animations that the students made during their visit are now up on the web at www.blip.tv on the Twin Vision page. There are four animations and the links and names of all four are given below. Enjoy. Two great stories for the week. 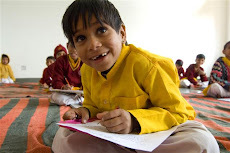 There is one small boy in the hostel studying in 3rd class, Yogesh. As quite a few students have now finished their exams and gone for holidays we were moving the remaining students together to make it easier to watch. We moved young Yogesh from his room three times but he kept moving back to his old room each evening even though there was noone else in that area. Finally we called him and asked why did he keep moving back. He replied that he wanted to stay in his room because it is the room that faces towards the Bhakti Sagar and as a result when Swamiji is in Jadan and giving satsang it is the best room for listening to what Swamiji is saying. What an awesome reply! The second story came to me via the husband of one of the ladies who is a cleaner/helper in our school. His wife is illiterate. She can (could) only understand the local Marwari dialect and subsequently can't understand the Hindi that is spoken on the radio etc. He was suprised when she started discussing with him the program that was just on the radio and asked how did she understand the Hindi. 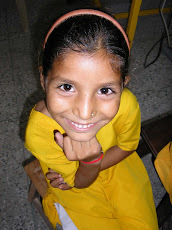 She had picked up Hindi from the classes going on in school as she is always working in the hallways outside as the classes are going on. Next day he was suprised that she had got up at three oclock and was sitting with the light on. He checked what she was doing ..........homework! One of our teachers had given her a book and taught her how to write the Hindi alphabet after school and she was "secretly" practicing. Last news she was starting to practice reading. I find that simply beautiful. 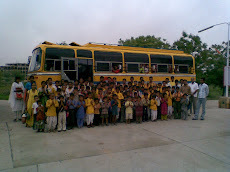 yesterday I was in a place called Nathdwara about 150kms from Jadan, searching for new school buses. A couple of members of the Ashram were already there since the day before exploring the area which houses the biggest bus industry in the state. It was a great day and we came back from there having purchased two buses for the school. They are in excellent condition and were quite a bargain. 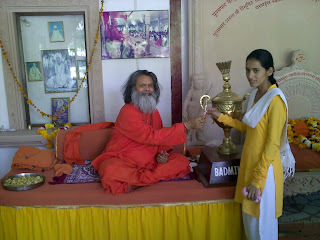 All in all it seemed that Guruji's blessings were with us throughout the day as it all went so smoothly. Awesome. Spare a thought for our young students in Primary School who are doing their examinations this week. In the past week we have been harvesting our wheat crop. 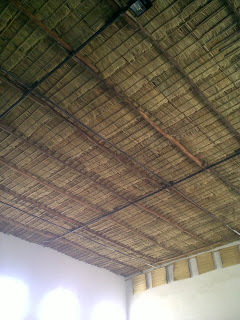 In the Ashram we grow organic wheat which is used throughout the year in our kitchen and in the school hostel. Today is New Years Day in India. So our students are wishing everyone a happy new year for the year 2066 in the Vikram Samvat calendar.